The great Hotmail migration is over. Microsoft recently announced that Hotmail as we've known it for yours is gone baby gone, and all its users have been transitioned to Outlook.com, which now boasts more than 400 million users worldwide. In its heyday, Hotmail was the go-to email client over competing services such as Yahoo. That changed around 2005, when Hotmail fans inevitably got an invite to Gmail from one of their friends. Gmail proved to be the superior Webmail service, and many Hotmail accounts began to languish. Microsoft's trying to shift the ball back to its court with Outlook.com. Beyond its sleek aesthetic and robust social media integration, Microsoft has packed the service with a bevy of handy-dandy new features in recent months, including a much improved Android app, a modern UI-style calendar, the Skype video call preview (which is not yet available in the U.S.), and new SMTP send and SkyDrive integration improvements added yesterday. But is Microsoft’s new email service ready to replace Gmail full-time? Is it good enough to entice the throngs of Hotmail users who left Gmail long ago return to their former stomping grounds? It’s awfully close, but Outlook.com isn’t quite ready yet. Here are the features Outlook.com still needs if it wants to go toe-to-toe with Gmail. Gmail search is just plain better than what Outlook.com has to offer. 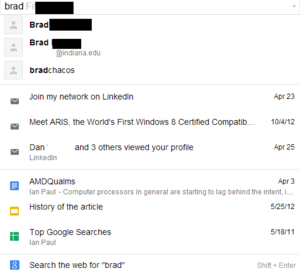 That may seem obvious, but Google only recently upped its game for Gmail search beyond a standard inbox query. Most notable is its Instant search results, which recommends different messages you might be searching for as you type. You can also search inside attachments, find Google Drive documents, and quickly get to a standard Google search on the Web. Outlook currently offers a fairly basic inbox search. There are a few nice features, including an Instant search-like feature that lets you quickly search by sender, recipient, or subject line. But it’s just not as good as what Gmail has to offer, especially without Bing and SkyDrive search integration. Gmail's Google Voice, Talk, and Hangout integration is nothing short of awesome. To combat that triple threat, Skype one-to-one video calling is slowly rolling out to Outlook.com users starting with the U.K., then the U.S. and Germany in the coming weeks. It isn't up to par with Google's offering quite yet, though. At launch, you will only be able to initiate Skype-based video calls with your Skype and Messenger contacts. Paid Skype features such as mobile and landline phone calls aren’t available yet. Other Skype staples are also missing such as sending files via IM, audio and video calls to your Facebook friends and screen sharing. But those features may come to Outlook.com eventually. You can change your theme color on Outlook.com from blue to another modern UI-styled flat color, but that’s about it. Gmail lets you add personalized background images, while Gmail gadgets and Labs plug-ins add optional functionality that have no counterpart in Outlook.com. Perhaps it’s not Microsoft’s style in this new era of the streamlined modern UI to add an overabundance of features to Outlook.com. At the very least, however, add-ons offering a quick view of your latest SkyDrive documents or your calendar appointments would be welcome additions. Outlook.com's filtering options are bare-bones compared to Gmail's. The killer productivity feature for Gmail is its filters that let you automate actions for specific types of messages. You could, for example, funnel all messages from john@johnsmith.com that have attachments to a specific label, or forward them to another email address, or delete them immediately. The options are near-endless. Outlook filters don’t have half that functionality. If you want to filter messages from a specific sender in Outlook.com, you start by clicking “Sweep” at the top of the inbox window. Then you will see options to “Move all from…” or “Delete all from…” Choosing “Move all from…” lets you funnel past and future messages from that sender to a specific Outlook.com folder. But that’s it. No options to forward, archive, automatically delete or any of the other options available with Gmail filters. Microsoft has done a great job with Outlook.com and the furious pace the company is setting with updates and new features means we may see more cool stuff come to Outlook.com soon. 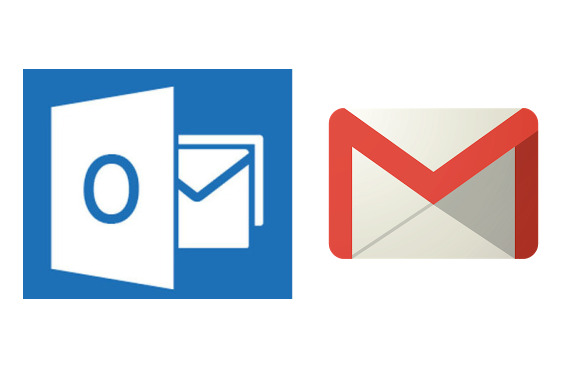 For now, however, Gmail still has an edge over Microsoft’s webmail service, but the feature gap between the two services is closing fast.